I blogged about these wonderful morsels of deliciousness last February here. It’s a funny story about how egg rolls have become a huge part of my life. A love story really…..Let me give you the Cliff Notes version of the history behind this recipe: I met my best friend Rebecca at Kohl’s…we both toiled, sweat, dreaded every waking minute worked there in the late 80’s and early 90’s. We met in 1994 while working in the same department together with Levi Bendover Pants and through our mutual hatred of such pants, we became friends. Als,o she smelled really good because she wore CK One perfume. Random, but true. In December of 1996, we got invited to a Christmas party at Rebecca’s home. 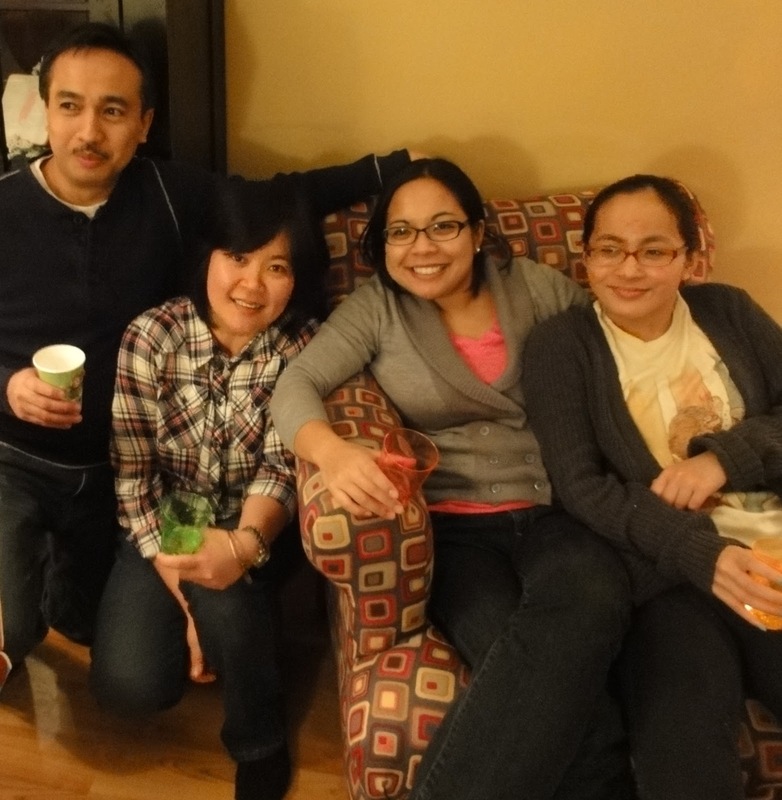 You have never lived until you attend a party in a Filipino home. The best way for me to describe their cuisine is a mix between Mexican food and Chinese food, so already amazing. The experience was one I wish to replicate every day of my life; never have I met so many friendly people in my entire life in one gathering. We felt like family from the first party and each one we attend is like a family reunion but the hit of the party was the Filipino Egg Roll. Nothing like a Chinese egg roll but rather more like a tacquito. Until one day in 2005, Rebecca sat my mom and I down to teach us how to make them ourselves. Then last year, I finally made them alone and found out that as labor intensive as they can be, they aren’t as scary to make as I made them out to be. It was as I was making them for the Super Bowl that I thought, hmm, I bet could make these a four ingredient recipe. So without further adieu, here is my four ingredient take on Filipino Egg Rolls. I will also share her original recipe as well alongside it. 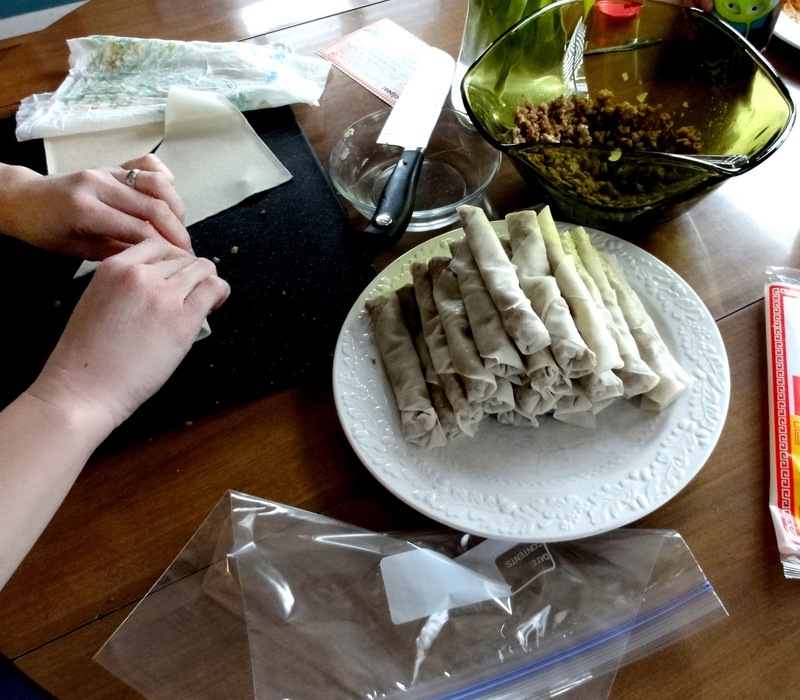 1- egg roll wrappers (spring roll shells) I only used one package and I used two pounds of pork so do the math accordingly. I get my wrappers at the Asian store down the street but if you don’t have one near you, you can try the international section at your local grocery store. 2- ground pork Here is my math: one pound for a family of 2-3; two pounds for a family of 4-6; anything larger get 3-4 pounds. 3- 1 large onion Diced very small. 4- 2 Tbsp. of oyster sauce and a dash of garlic powder You can find oyster sauce in the Asian section at your local grocery store. I bet you never even noticed it there before. I didn’t until I made this recipe! The only thing extra that Rebecca would add would be sweet potato, if you would like to. Also, her friend Yvette told me that you could also make this a veggie recipe omitting the meat and using potatoes, green beans, garlic and onions. That sounds wonderful too! 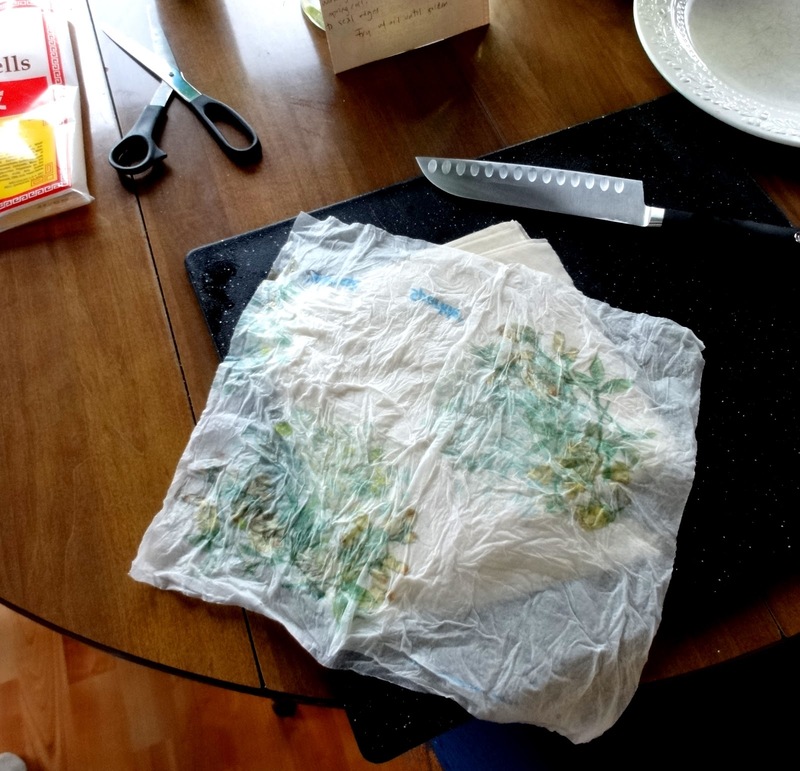 You will need to thaw the egg roll wrappers before you use them (at least that is how my wrappers come from the store) for 30 minutes. So bring them out before you start browning the pork. OR you could brown your pork the day before, put it in Tupperware in the fridge and assemble the egg rolls the next day. I have done both ways and I think it works better to make the pork ahead of time. So assuming you browned the pork first, add the onion when the pork is completely browned then add a dash of garlic powder and 2 tbsp. of the oyster sauce. Mix together and cook a little longer to let the flavor set in. Set aside to cool then put in Tupperware in the fridge overnight. See the damp paper towel? It is covering the wrappers so they don’t stick together or get too stiff. You cut the wrappers on the diagonal, like above. Then you will have two triangle pieces of wrappers. 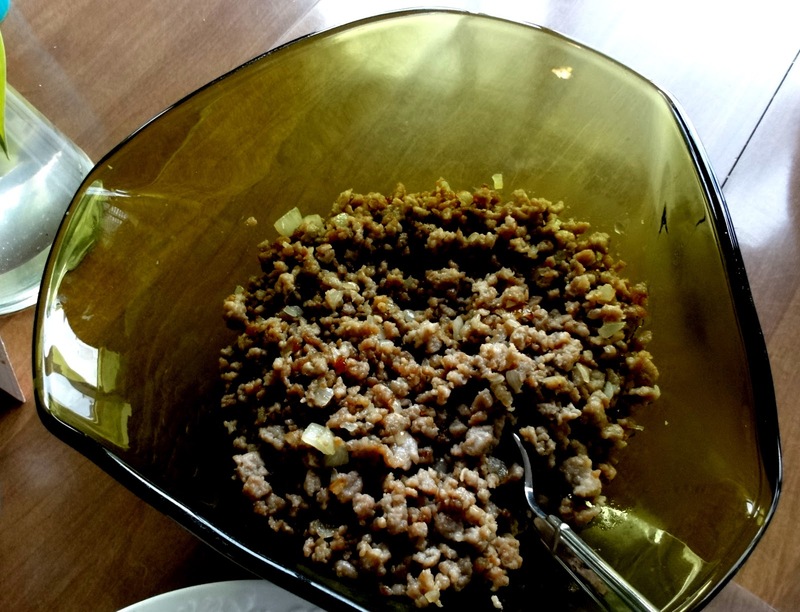 Next, take a tablespoon or so of the meat mixture and place it in a line parallel to the bottom line of the egg roll wrapper. When looking at your wrapper, it will look just like a triangle with the point at the top. Tuck in the right and left sides and roll upwards. Take some water (I keep a little in a dish next to me) and wet the edges to seal. Place on a plate, like I have above and keep doing this until you are done. Then I put all of them in a Ziploc bag to place in the freezer. 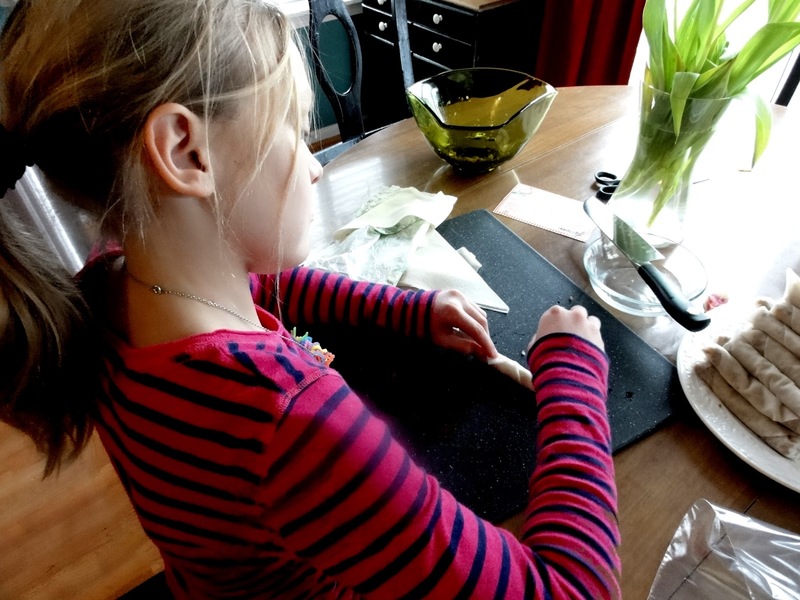 I just taught my oldest daughter, Anna how to make them this year too! Freeze them until you are ready to fry them up. When you are ready to prepare your egg rolls, add three cups of vegetable oil to the bottom of a fry pan (this is not a fat free meal) and heat for a few minutes to get ready to fry. Once your oil is ready, place about five to seven egg rolls in the pan and fry until golden and crispy. You can eat these plain but we love to dip them in apple cider vinegar thanks to the tip from Bernie, Rebecca’s husband. We have made these as a meal before. Here is Rebecca with her family. Or as we like to call them…..
Love these four people so much. I know this recipe looks like a lot of work but trust me, it is so worth it. Head here for more four ingredient recipes! 1- egg roll wrappers spring roll shells I only used one package and I used two pounds of pork so do the math accordingly. I get my wrappers at the Asian store down the street but if you don't have one near you, you can try the international section at your local grocery store. 4- 2 Tbsp. of oyster sauce and a dash of garlic powder You can find oyster sauce in the Asian section at your local grocery store. I bet you never even noticed it there before. I didn't until I made this recipe! The only thing extra that Rebecca would add would be sweet potato if you would like to. Also her friend Yvette told me that you could also make this a veggie recipe omitting the meat and using potatoes, green beans, garlic and onions. That sounds wonderful too! After the wrappers have thawed for 30 minutes, get out a sharp knife, a cutting board, dampen two paper towels, and get your pork out. I also have a plate ready so you can put the egg rolls you already assembled onto. Cut the wrappers on the diagonal so you have two triangles. Take a tablespoon of the meat and line it along the bottom of the wrapper opposite the pointy angle. 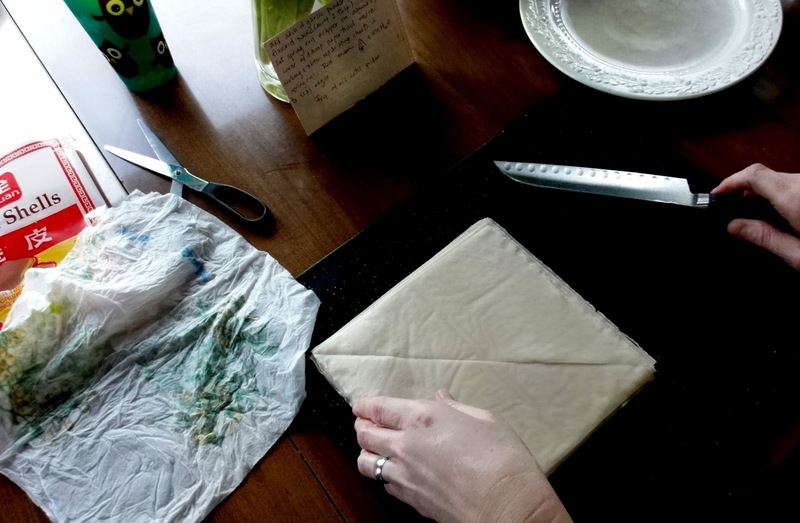 Roll it up and fold in the sides, kind of like folding a burrito. Place on a plate and repeat. It is recommended that you freeze these before heating. You can freeze in a giant freezer bag. When ready to cook, heat about two cups of olive oil in a fry pan. Once oil is hot, place four to five egg rolls in the pan. Fry until both sides are golden. Place on a paper plate to drain the grease. Years ago, I worked with a Filipino gal who made these to share with us all the time. They are sooo yummy. Thanks for the recipe share! Awesome post! Now I want some eggrolls! Will you make some for me? 🙂 Next time, pancit! Aww Rebecca…you KNOW you still make the best egg rolls. And yes, Pancit next time!!! Stumbled onto your blog and just wanted to show yous some blog luv! def enjoyed this post 🙂 and those look so YUMMY!!! I will add that party to my Bloglovin’ feed. Thank you for sharing! I love Filipino food so much that my best friend (who is also Filipino) says I am an adopted member of the family. Thank you for visiting and I hope you come back! These sound so delicious – and simple! Thanks for sharing at the What’s for Dinner Party! They are a bit time-consuming to assemble but they are worth it! Thank you for having me!